Derby County kept alive their faint hopes of automatic promotion to the Premier League with victory over relegation-threatened Doncaster. The Rams knew anything but a win would mean promotion for Burnley, who won at Blackpool earlier on Friday. George Thorne curled his first of the season late in the opening half, before Theo Robinson went close to levelling. 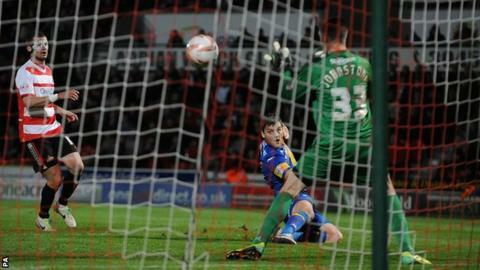 Chris Martin turned home Jamie Ward's cross to seal the win and leave Donny three points above relegation. Derby's victory guarantees a play-off spot, and keeps them eight points behind Burnley - who occupy the Championship's second automatic promotion place - with three games to play. But the Clarets will definitely secure a return to the Premier League if they beat Wigan at Turf Moor on Monday, whatever the Rams do at home to Barnsley. Ahead of kick-off, Derby manager Steve McClaren said he had "expected Burnley to win" at Blackpool and that a play-off place was his side's aim. Since arriving in September, the former England manager has guided County to 20 wins in 34 league matches, form which has seen them shoot from 14th position to third and sparked hope of a place in the top flight for the first time since 2008. If they fall short of an automatic return, McClaren's side are set to enter the play-offs with plenty of momentum after a fifth win in seven outings. Doncaster manager Paul Dickov called for his side to show his "drive, enthusiasm and belief" and they defended diligently in a tight first half, while using wingers David Cotterill and James Coppinger on the counter attack. They almost went ahead when Derby defender Richard Keogh's back pass rolled towards his own goal and would have gone in but for a quick recovery by Lee Grant to stop the ball on the line. Rams goalkeeper Grant smartly tipped over to deny Rovers top-scorer Chris Brown's powerful header, before Thorne curled the opener from range. McClaren moved from the directors' box to the touchline just in time to see the 21-year-old, on loan from West Brom, convert his first goal in a Derby shirt. The Rams have led at half-time on 19 occasions this season - more than any side in the league - and went close to doubling their advantage after the break when Craig Bryson raced on to Thorne's pass, only for Sam Johnstone to parry wide. Burnley will be promoted to the Premier League if they beat Wigan Athletic on Monday. Gabriel Tamas, playing in a protective mask, headed over as Doncaster fought back. But only Charlton and Blackpool have managed fewer goals in the league than Dickov's side this season, and they could not find an equaliser to aid their survival bid. Rovers - who face third-from-bottom Millwall on Monday - almost drew level when substitute Robinson's lob was blocked by Grant. But the contest was effectively ended when Martin stabbed home. The striker stretched to convert a 19th league goal of the season, before Ward, whose cross created the opening, was denied a goal when his audacious chip was kept out by a finger-tip Johnstone save. Match ends, Doncaster Rovers 0, Derby County 2. Second Half ends, Doncaster Rovers 0, Derby County 2. Marc (Doncaster Rovers) is shown the yellow card for a bad foul. Jamie Ward (Derby County) wins a free kick on the right wing. Foul by Marc (Doncaster Rovers). Attempt blocked. Enda Stevens (Doncaster Rovers) left footed shot from the centre of the box is blocked. Assisted by Paul Quinn. Corner, Derby County. Conceded by Sam Johnstone. Attempt saved. Jamie Ward (Derby County) right footed shot from outside the box is saved in the top centre of the goal. Assisted by Chris Martin. Substitution, Doncaster Rovers. Marc replaces Chris Brown because of an injury. Foul by Abdoulaye Méité (Doncaster Rovers). Corner, Doncaster Rovers. Conceded by Richard Keogh. Substitution, Derby County. Jeff Hendrick replaces Will Hughes. Goal! Doncaster Rovers 0, Derby County 2. Chris Martin (Derby County) right footed shot from the left side of the six yard box to the top right corner. Assisted by Jamie Ward with a cross. Attempt saved. Jamie Ward (Derby County) right footed shot from outside the box is saved in the centre of the goal. Assisted by Craig Forsyth. Attempt saved. Theo Robinson (Doncaster Rovers) left footed shot from the centre of the box is saved in the centre of the goal. Assisted by Mark Duffy. Attempt missed. David Cotterill (Doncaster Rovers) right footed shot from outside the box is high and wide to the right. Assisted by Enda Stevens. Chris Martin (Derby County) is shown the yellow card. Paul Quinn (Doncaster Rovers) is shown the yellow card for a bad foul. Foul by Paul Quinn (Doncaster Rovers). Attempt missed. Gabriel Tamas (Doncaster Rovers) header from the centre of the box is close, but misses the top left corner. Assisted by David Cotterill with a cross following a set piece situation. Chris Brown (Doncaster Rovers) wins a free kick on the right wing. Attempt blocked. Craig Forsyth (Derby County) left footed shot from outside the box is blocked. Assisted by Craig Bryson. Attempt missed. David Cotterill (Doncaster Rovers) right footed shot from outside the box misses to the left. Assisted by Paul Keegan. Corner, Doncaster Rovers. Conceded by George Thorne. Corner, Doncaster Rovers. Conceded by Jamie Ward. Hand ball by Will Hughes (Derby County). Attempt missed. Johnny Russell (Derby County) left footed shot from outside the box misses to the left following a corner. Corner, Derby County. Conceded by Abdoulaye Méité.